The flooring in your home or business is one of the key design elements that help to define the look and atmosphere of your space. They are also one of the most functional and used parts of your property since anyone seeing it will likely be stepping on it at some point. That means you are going to want to make sure your property has flooring that is both attractive and durable. This is especially true for high-use rooms such as the bathroom, kitchen, and entryways. Are you worried about water and excessive moisture damaging your new floors? Then it is time for you to make the switch to waterproof flooring in Lethbridge, AB. The team at our flooring showroom is proud to bring you water-resistant flooring, including carpet, laminate, and vinyl options, that looks good in any room of your home or business. The waterproof floors we offer are perfect for kitchens, bathrooms, and even outdoor spaces around your property. If your room is prone to moisture or spills, then it is time to consider purchasing our waterproof flooring. Using modern manufacturing techniques, these floors are designed to hold up in even the most moisture-prone environments. It is time for you to get the floor you want for your space without having to worry about the potential of water damage. At our flooring showroom, we sell and install waterproof vinyl flooring that is perfect for kitchens, bathrooms, basements, cafeterias, mudrooms, and just about any other room with the potential of getting wet. Manufactured using only high-grade materials, our floors are built to hold up even in the wettest of environments. Visit our flooring showroom for assistance if you need waterproof flooring that is as appealing as it is durable. One of our friendly and experienced associates will happily help you find and pick out the product that best suits your needs and style. Give your home a unique ambiance with the help of our waterproof laminate flooring. Many property owners simply love the value and appeal of hardwood and natural stone flooring. Unfortunately, hardwood flooring just doesn’t do very well in water-prone areas while natural stone, while not vulnerable to water damage, is still quite hard underfoot. So how do you get the look that you want while avoiding the pitfalls of these flooring types? 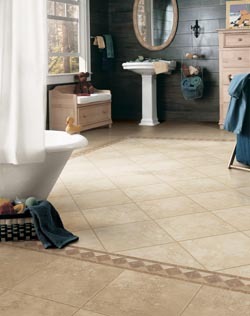 For a beautiful and softer choice, consider waterproof vinyl or laminate floors. These floors not only look good and prevent moisture damage, but can also perfectly mimic the look of hardwood or natural stone. Due to their waterproof cores, vinyl and laminate floors do not degrade, rot, or expand. They also prevent liquid from soaking into the subfloor—water damage to the subfloor can cause significant damage to your home and its structural integrity. To maintain your floor’s beauty, simply sweep and mop it when it is dirty. Waterproof floors hold up well under heavy foot traffic and are perfect for busy households. Most importantly, we proudly recommend highly skilled subcontractors to perform waterproof flooring installation for you so you can enjoy peace of mind in regards to your new floor. When you think about waterproof flooring there is a good chance that you can come up with a wide variety of looks and styles right off the top of your head. Something you may never have considered, however, is carpeting. Believe it or not, though, there is such a thing as waterproof carpet. That means you are able to add carpet to rooms you didn’t previously think possible without having to worry about potential side effects, such as staining, lifting, and other problems. The waterproof carpet offered at our showroom protects floors from spills, pet accidents, and moisture. Not only are these carpets stain-resistant, but they will not suffer from any type of water damage. As a matter of fact, they also prevent water from penetrating the floor beneath so you can avoid potentially costly repairs in the future. Instead of worrying about your carpet, let us ease your carpet concerns with our impressive waterproof flooring options. Our state-of-the-art waterproof carpets offer a level of protection that ordinary carpets simply cannot. Contact us now for your free in-home estimate. We proudly serve customers throughout Lethbridge, Alberta.